WASHINGTON, Nov 8 2011 (IPS) - A new report on Iran’s nuclear programme provides substantial evidence that Iran carried out extensive research into how to make a nuclear weapon prior to 2003 but is shaky about how much work has continued. Citing “a wide variety of independent sources”, including material from 10 member states and from a foreign scientist who worked on the programme, the International Atomic Energy Agency (IAEA) said Tuesday that Iranians had conducted multiple activities “relevant to the development of a nuclear explosive device” from the late 1990s until 2003. The material, listed in great detail in a 14-page annex to a regular IAEA report on Iran, should provide ample new ammunition for the agency and the international community to press Iran for answers and for improved access to its nuclear facilities. There is no indication, however, that Iran has actually built a nuclear weapon. There is new information that Iran experimented with producing uranium metal for a bomb, with high explosives needed to trigger a nuclear device, and studied how to produce a warhead small enough to fit on a ballistic missile. Satellite information shows Iran built a “large explosives containment vessel” at a site near Tehran in which to conduct experiments, the report said. “It remains for Iran to explain the rationale behind these activities,” which violate Iran’s commitments to peaceful nuclear activities under the Nuclear Nonproliferation Treaty, the agency said. 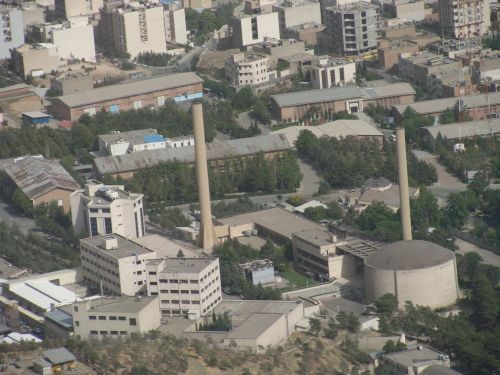 The report is much less authoritative about what went on after 2003, when Iran at least temporarily halted the programme following the revelation that it was building a uranium enrichment plant at Natanz and a heavy water plant and reactor at Arak. Iranian President Offers Nukes Compromise to U.S.
“The Agency’s ability to construct an equally good understanding of activities in Iran after the end of 2003 is reduced due to the more limited information available to the Agency,” the report acknowledged. Thus the findings appear to be consistent with a much maligned 2007 U.S. National Intelligence Estimate which expressed “medium confidence” that Iran had not restarted a weaponisation programme at that time. Conservative groups immediately pounced on the findings to demand harsh new measures against Iran, including sanctioning Iran’s Central Bank and retaining “all options” – meaning a military attack. However, the main aspects of the programme have been known for several years and discussed in previous IAEA publications. David Albright, a former nuclear inspector and president of the Institute for Science and International Security, told IPS that he was comforted by the new evidence that “pressure worked” and that Iran stopped what the IAEA called a “structured” programme in 2003. Sourcing for allegations of Iranian work after 2003 is thin. For example, only one unnamed IAEA member provided information that Iran had tried after 2004 to manufacture elements of what is known as a neutron initiator, necessary to trigger a chain reaction leading to a nuclear explosion. Two unnamed member states were the source of allegations that in 2008 and 2009, Iran carried out computer modeling of a nuclear device “subjected to shock compression”, another step in building a reliable bomb. The Iranian government had no immediate reaction to the report, which was given to members of the IAEA board and swiftly leaked to the press. In the past, Tehran has accused the IAEA of confronting it with forgeries, while admitting that some research has taken place. The Barack Obama administration was also subdued and suggested it would use the information to press harder for a diplomatic solution, including tougher enforcement of existing sanctions against Iran. In some respects, the most worrisome aspects of the report were in its initial pages devoted to Iran’s safeguarded facilities. The report said Iran has continued its slow but steady accumulation of enriched uranium and now has nearly 5,000 kilogrammes of uranium enriched to five percent and nearly 74 kilogrammes of uranium enriched to 20 percent U-235. If converted to weapons grade uranium – which is 90 percent U-235 – that stockpile is enough for several bombs. The findings were revealed in advance of an IAEA board meeting next week that is likely to be stormy.